3-D printers that could crank out parts for spacecraft and space stations – from wrenches to screws – all while in orbit is becoming one step closer to reality. A company called Made in Space has completed a successful testing period of two 3-D printers on multiple NASA flights, with a scaled-down wrench becoming the first-ever tool printed in partial zero gravity. Printing out parts in space could eventually be transplanted to other worlds such as the moon, where it could help human colonies gain a foothold by printing out robot parts or buildings, piece by piece. The test printing took place on multiple zero-gravity flights provided by NASA’s Flight Opportunities Program, which offers opportunities for space technologies to be tested in a relevant environment.Two modified off-the-shelf 3-D printers were tested – one provided by their partner 3-D Systems and another custom-made printer designed to manufacture structures in space. The Made in Space team poses with their 3-D printer. Three-dimensional printers allow items to be built layer by layer, similar to how a conventional printer lays ink on paper. The objects are made with thin layers of "feedstock," which can be metal, plastic or a variety of other materials. Made in Space believes this technology will eventually enable satellites, spacecraft and other large structures to be built in space one day. 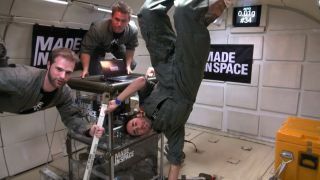 Now that Made in Space has a proof of concept, the next step is refining the 3-D printer for use in the constant zero-gravity environment of space. “Future flights will serve as a test bed for more advanced analysis on the printing process in zero-gravity, as well as learning how to control other issues that may arise in space, such as radiation, temperature control and material processes,” Kemmer told TechNewsDaily. The company said it plans to have a functional 3-D printer in space within three years. Reach TechNewsDaily senior writer Samantha Murphy at smurphy@techmedianetwork.com. Follow her on Twitter @SamMurphy_TMN.